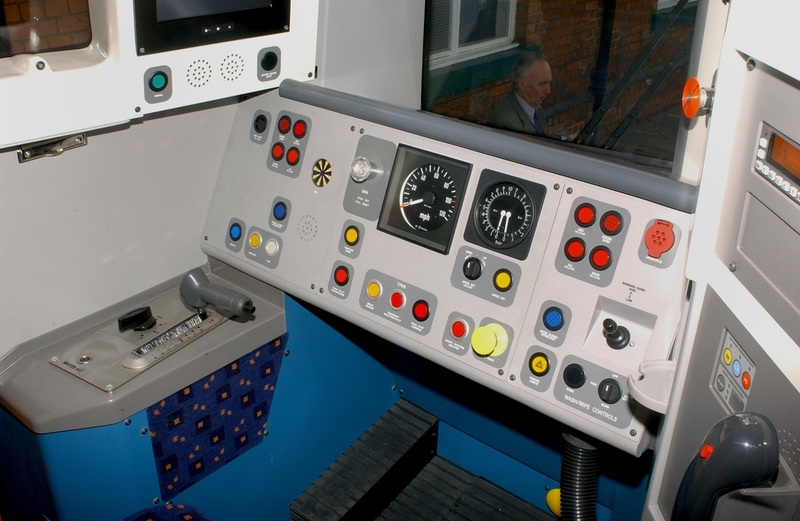 Above: Class 303 fitted with intelligent train development equipment. 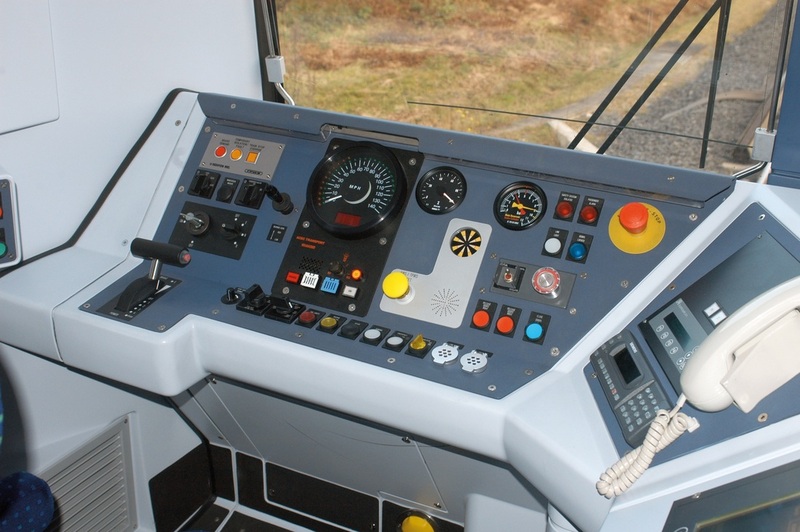 Above: Class 305. Refurbished with cab radio. 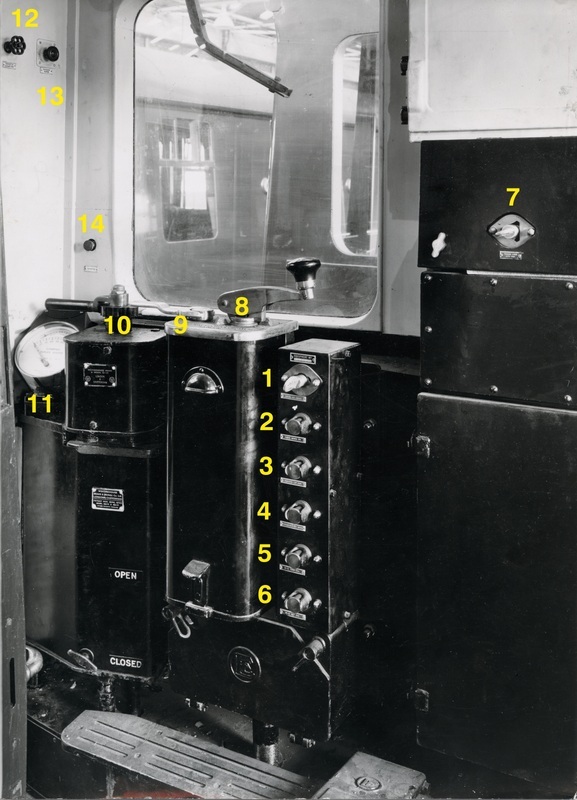 Seven position electro-pneumatic/Westinghouse air brake controller, 2: Windscreen wiper valve, 3: Main reservoir and Brake pipe pressure gauge, 4: Brake cylinder pressure gauge, 5: Speedometer, 6: Instrument light dimmer switch, 7: Marker light switch, 8: Destination light switch, 9: indicator light dimmer switch, 10: Headlight switch, 11: Tail light switch, 12: Automatic Warning System (AWS) sunflower indicator, 13: Stornophone 6000 cab radio, 14: Power controller, 15: Master switch (forward, off, reverse), 16: Pantograph up and reset button, 17: EP brake indicator light, 18: Bell button, 19: AWS (Automatic Warning System) reset button, 20: Instrument light switch, 21: Demister switch, 22: Horn valve. 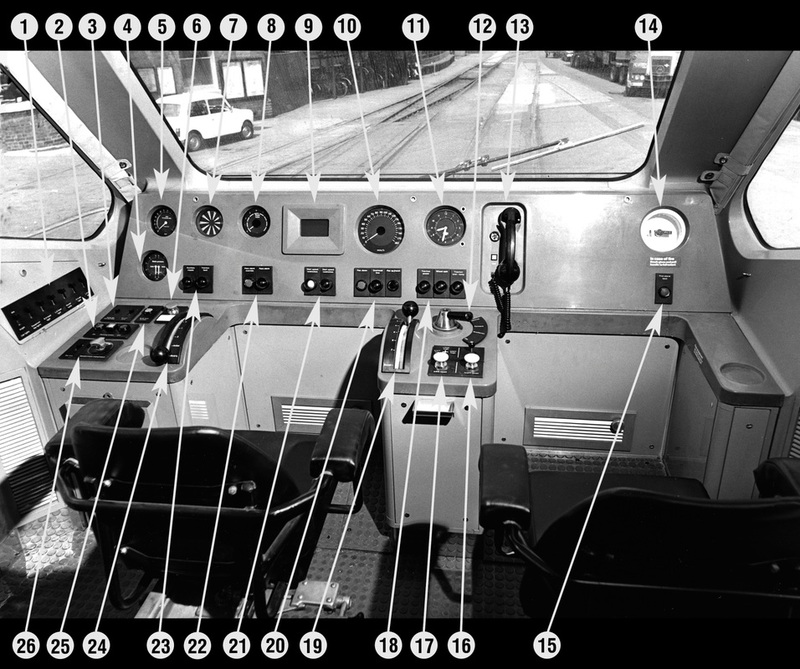 Left Class 306 - Original cab layout for DC operation. 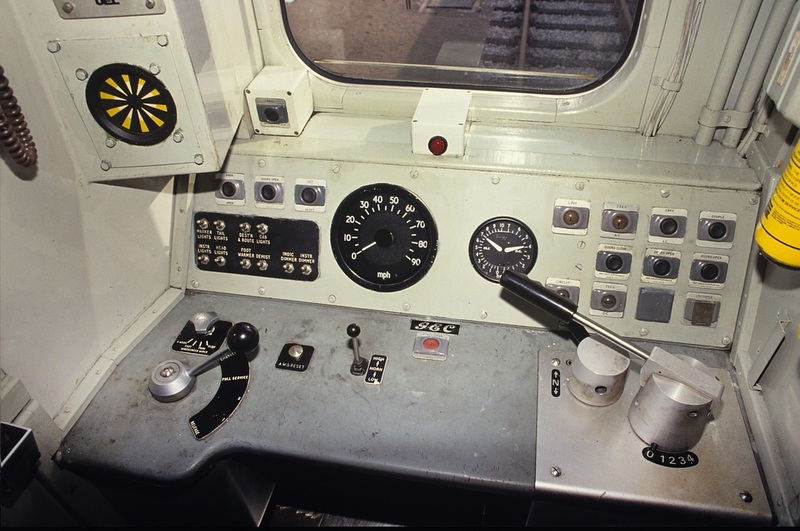 Below: Class 306 - Modified for AC operation. 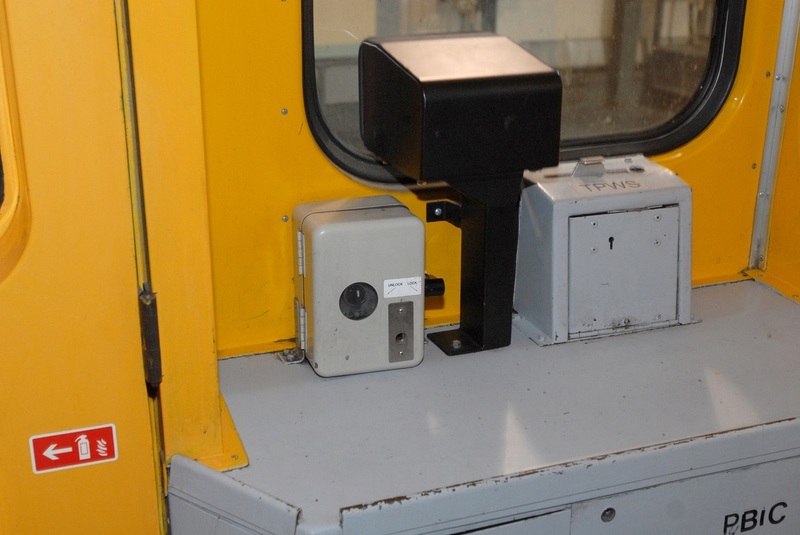 1: Control key switch, 2: Pantograph down button, 3: Pantograph up button, 4: Overload relay reset button. 5: Motor Generator ‘trip’ button, 6: Motor Generator ‘set’ button. 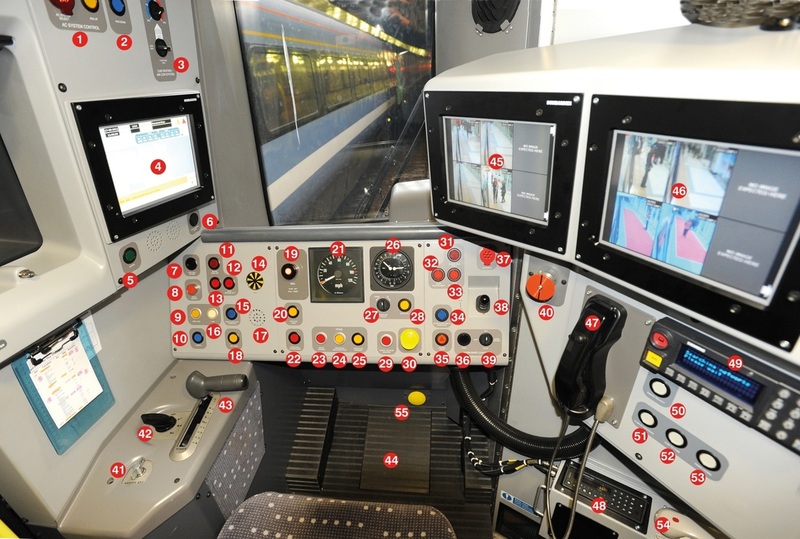 7: Train Line key switch, 8: Power controller, 9: Master switch, Forward, Off, Reverse, 10: Electro-pneumatic brake controller, 11: Duplex gauge and Brake Cylinder gauge, 12: Whistle isolating valve, 13: Window wiper switch, 14: Whistle button, 15; Automatic Warning System (AWS) reset button, 16: Automatic Warning System ‘sunflower’ indicator - shows all black with a clear (green) signal, or black and yellow for a caution (yellow) or stop (red) signal, 17: Cab to cab and guards van ‘Loudaphone’. 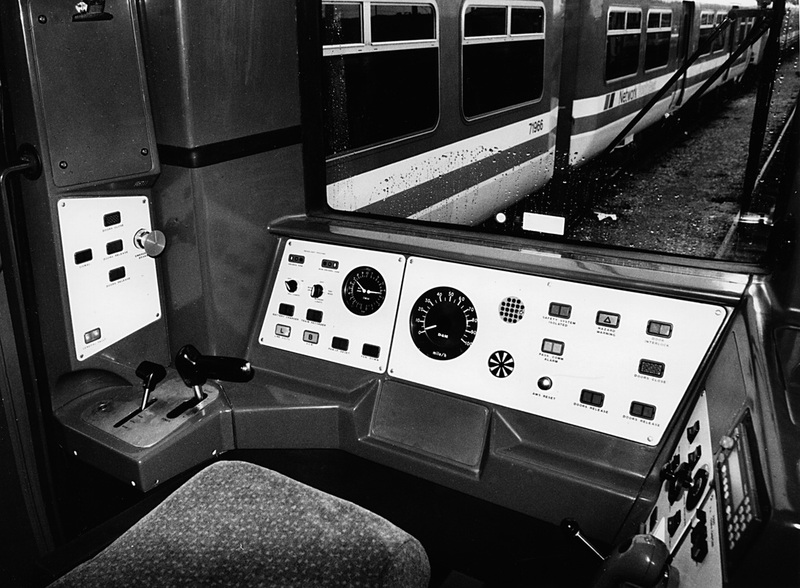 Left: Class 307, cab layout in dc power days. 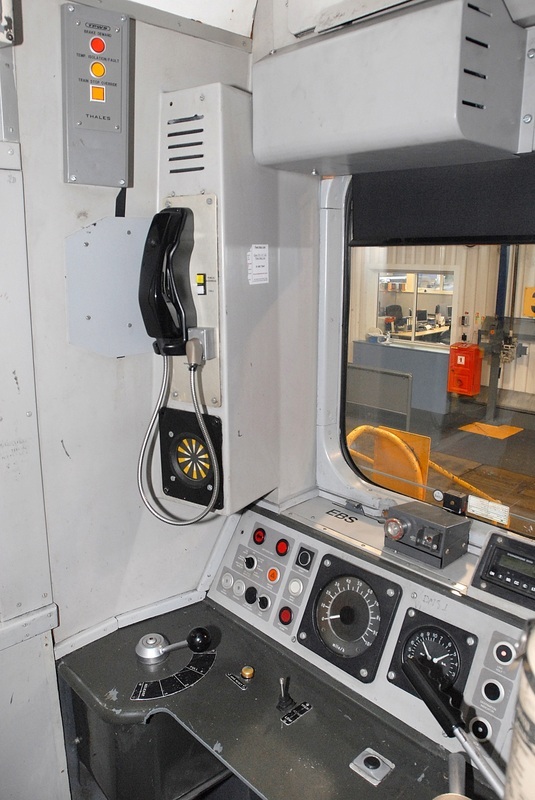 Left: Class 309 'Clacton' set No. 602. 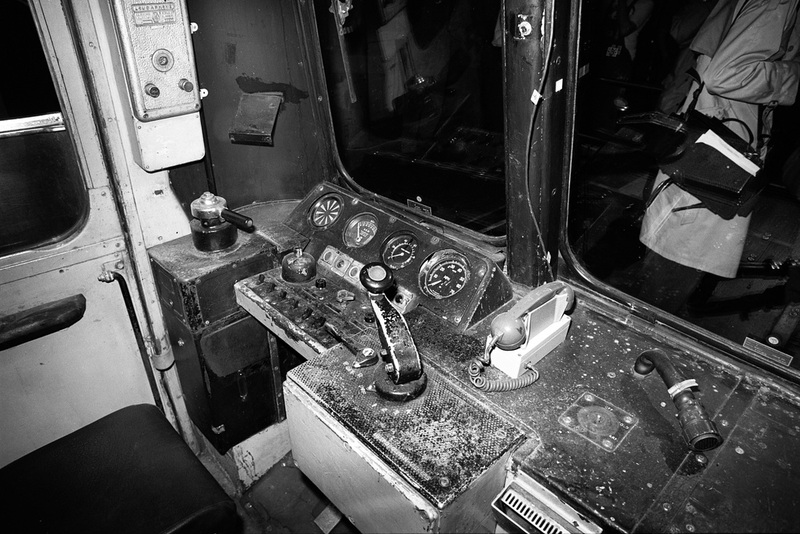 Left: Class 313 right side of cab desk in 'as delivered' state. 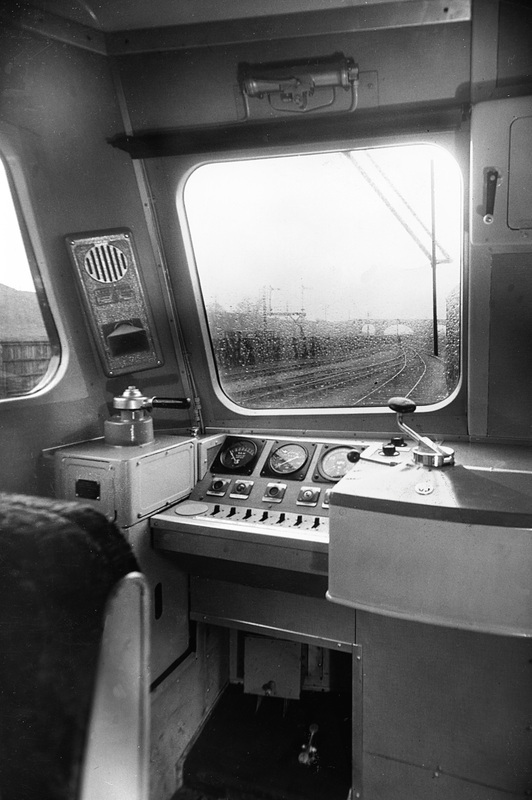 Left: CLass 313/0 with cab radio and revised switches. 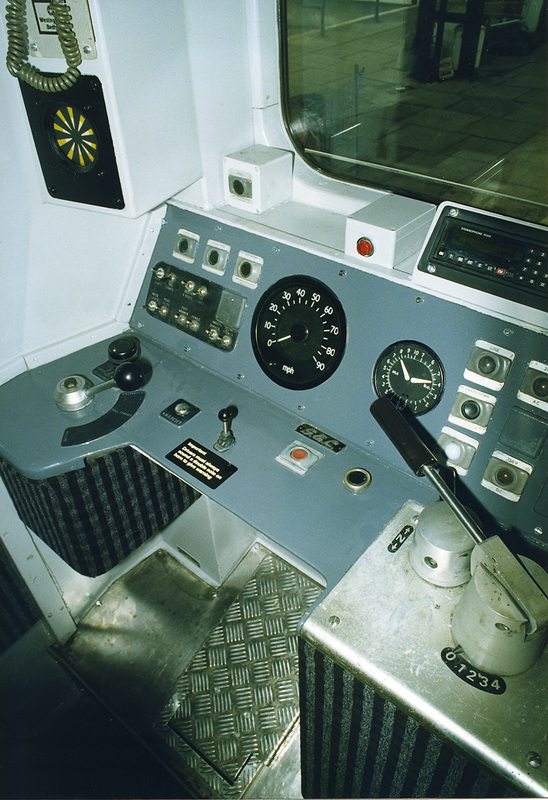 Class 313/0 cab radio and communication panel. 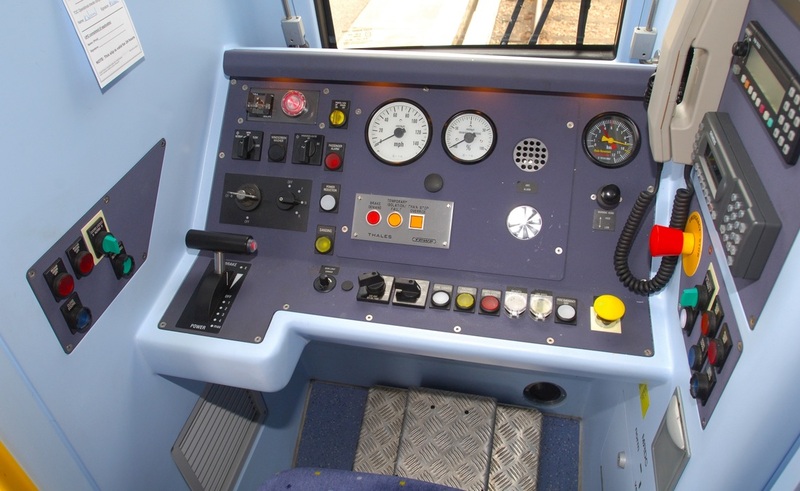 Class 315 – Modernised with DRA, radio and new switch gear. 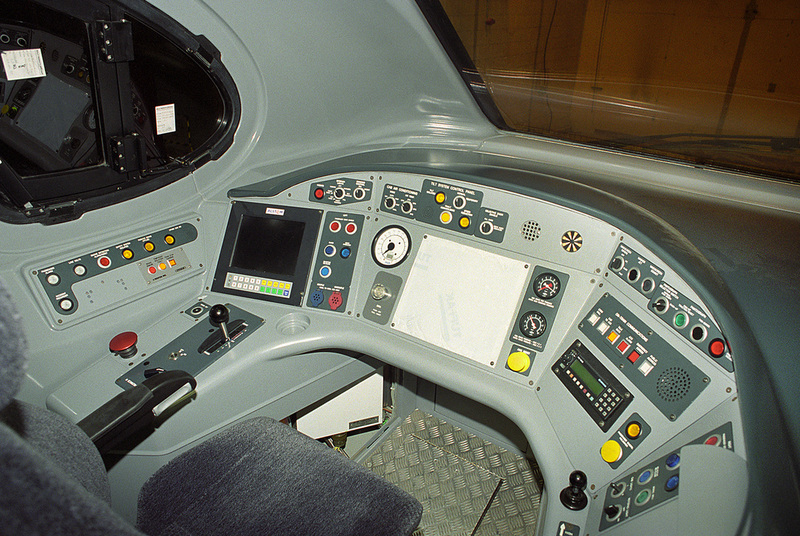 Left: Class 315 – modernised with DRA, radio, new switch gear and TPWS. Above: view shows forward facing camera. 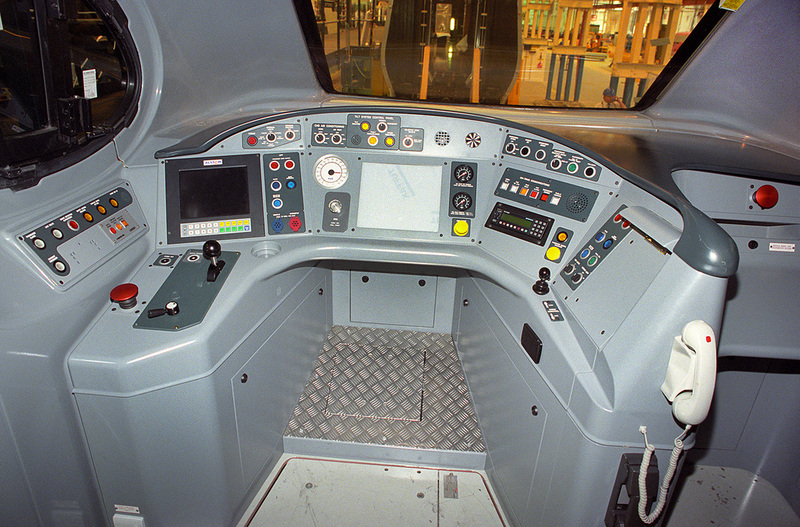 Above: Class 316 development unit. No. 316999. Above: Class 317 No. 317307. 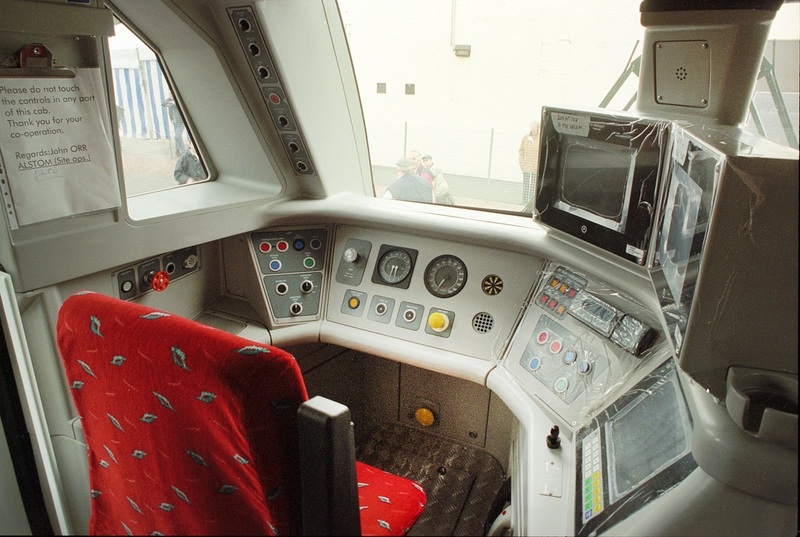 Above: Class 317, modified with TPWS and DRA. Set No. 317336. 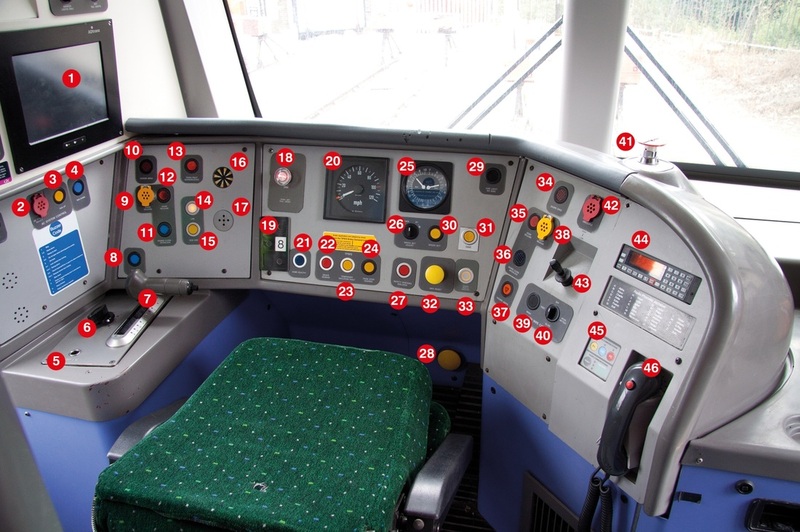 Left: Class 319/1 No. 319161 in as built condition. 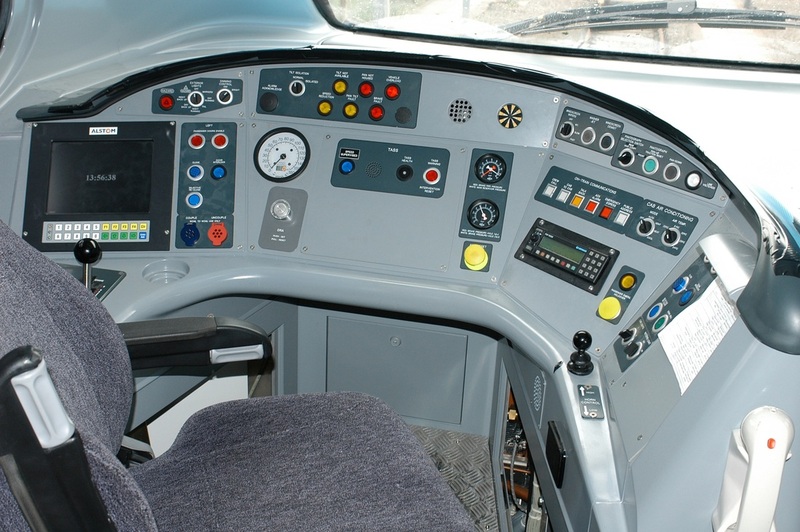 Above: Class 321/3, No. 321337. 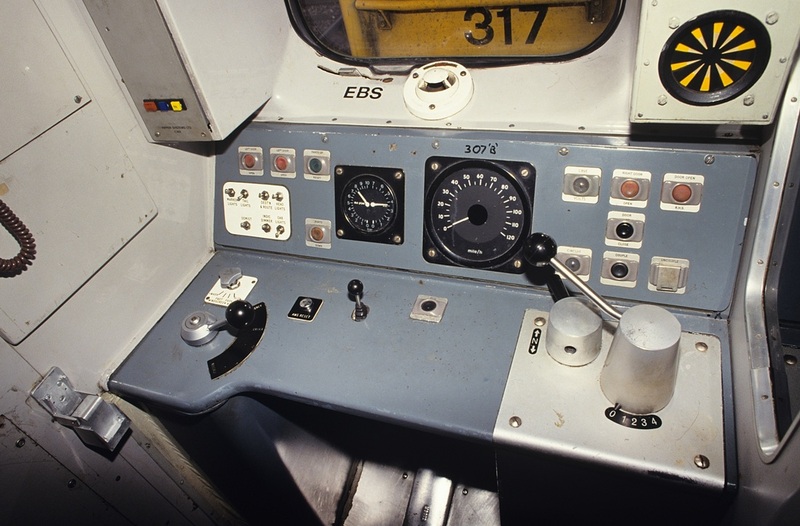 Above: Class 322 showing as built condition. 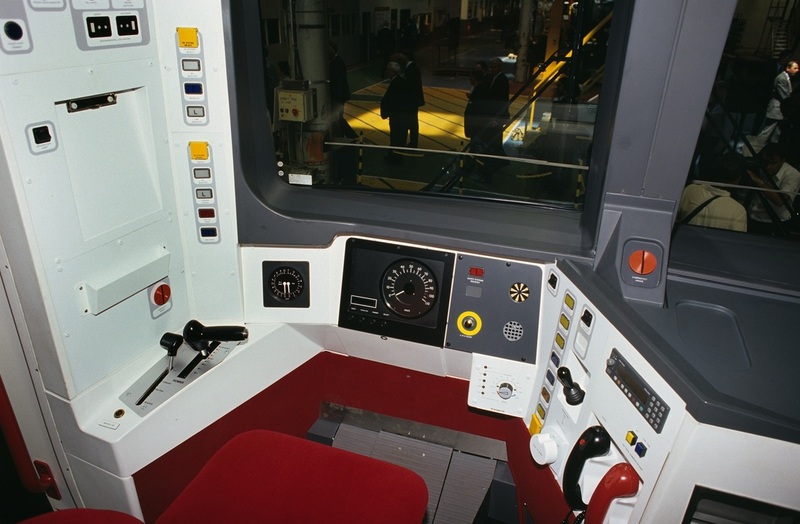 Above: Class 325 'Railnet' EMU. Above: Class 332 'Heathrow Express'. 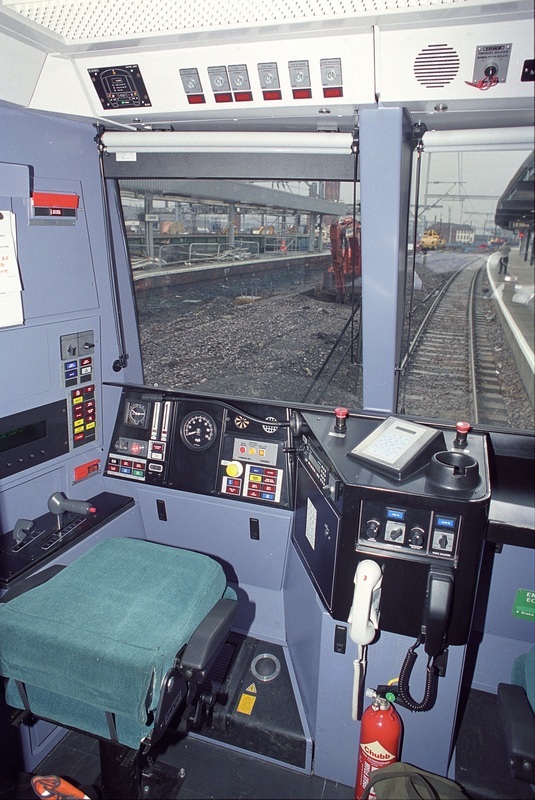 Above: Class 334 in as delivered condition. Above: Class 357. 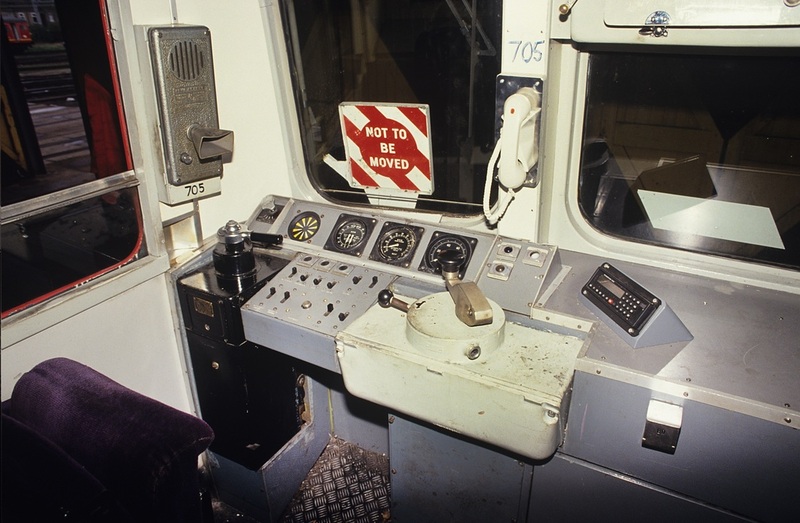 Equipment: 1: On board computer screen, 2: AC system select button, 3: Pantograph up button, 4: Pantograph down button, 5: Master key socket, 6: Direction switch, 7: Power/brake controller, 8: Couple button, 9: Left door release button, 10: Left doors open warning light, 11: Left doors close/interlock, 12: Door release indicator, 13: Train fault acknowledge button, 14: Line (power) indicator light, 15: Vacuum circuit breaker, 16: AWS indicator, 17: AWS buzzer, 18: Drivers reminder appliance, 19: Train length indicator (4, 8, 12), 20: Speedometer, 21: On Train Monitoring and Recorder Healthy indicator, 22: TPWS brake demand, 23: TPWS temporary isolation fault, 24: TPWS train stop override, 25: Brake gauge, 26: Speed set adjust switch, 27: Safety systems isolated warning, 28: Pass comm override button, 29: Cab light right side, 30: Speed set button, 31: Sanding button, 32: AWS reset button, 33: Sanding system healthy button, 34: Right side door open indicator, 35: Door release right side, 36: Right side door close button, 37: Hazard warning light button, 38: Right side door release button, 39: Windscreen wiper wash button, 40: Windscreen wiper control, 41: Emergency brake plunger, 43: Warning horn valve, 44: Cab radio, 45: PA and radio selector, 46: Telephone handset. 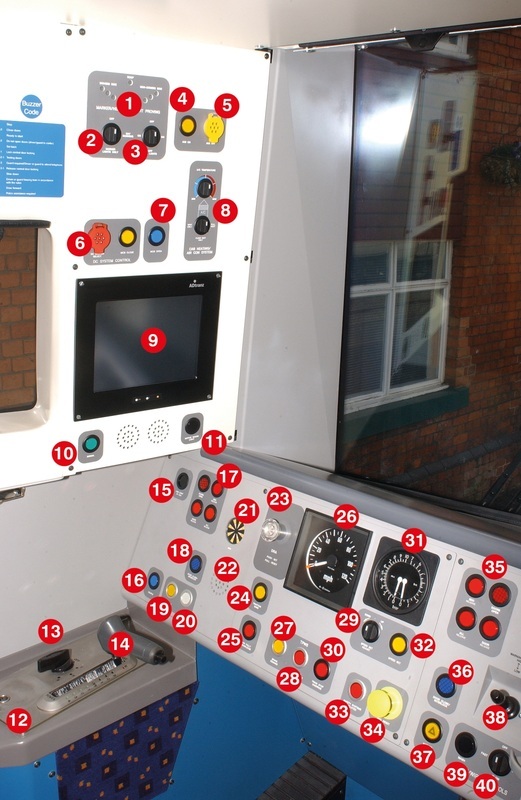 3 - Drivers master key socket, 4 - Windscreen wiper switch, 5 - Master switch (off, for/net/rev), 6 - Windscreen washer button, 7 - TPWS control panel, 8 - Windscreen heat switch, 9 - Drivers reminder appliance isolation switch, 10 - Drivers reminder appliance, 11 - Main reservoir and brake cylinder gauge, 12 - Speedometer, 13 - Horn valve, 14 - Traction/brake efficiency, 15 - AWS sunflower, alarm and reset button, 16 - Right side door release, 17 - Emergency brake plunger, 18 - Right door release, 19 - Cab fan speed, 20 - Cab temperature, 21 - Cab-shore radio, 22 - Communications panel, 23 - On board radio/phone, 24 - Desk light dimmer switch, 25 - Sanding button, 26 - Cab light switch, 27 - Passenger alarm light, 28 - Marker/head/tail light switch, 29 - Line light, 30 - Tail light indicator, 31 -Hazard warning indicator, 32 - Pantograph up/reset button, 33 - Safety systems isolated warning light, 34 - Uncouple button, 35 - Low speed button, 36 - HVAC off (close air con inlets), 37 - Doors locked light, 38 - Close doors, 39 - On board diagnostic system. 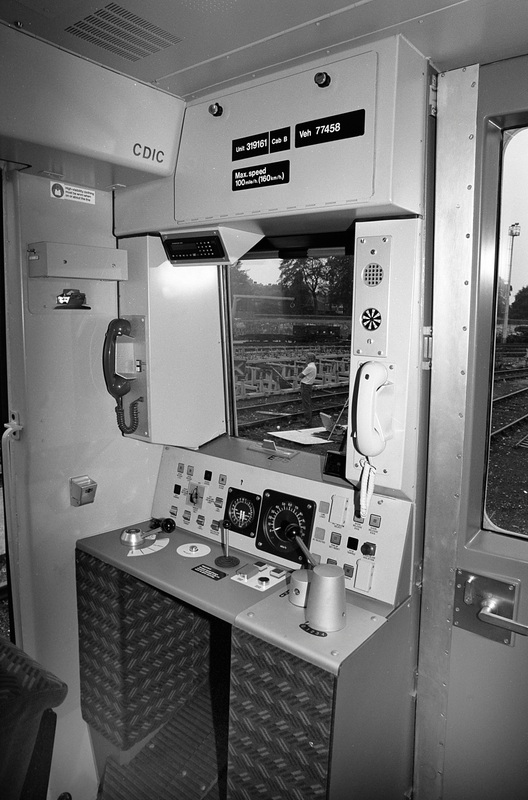 Above: Class 360/2 'Desiro' for Heathrow Connect, fitted with Great Western ATP – As delivered. 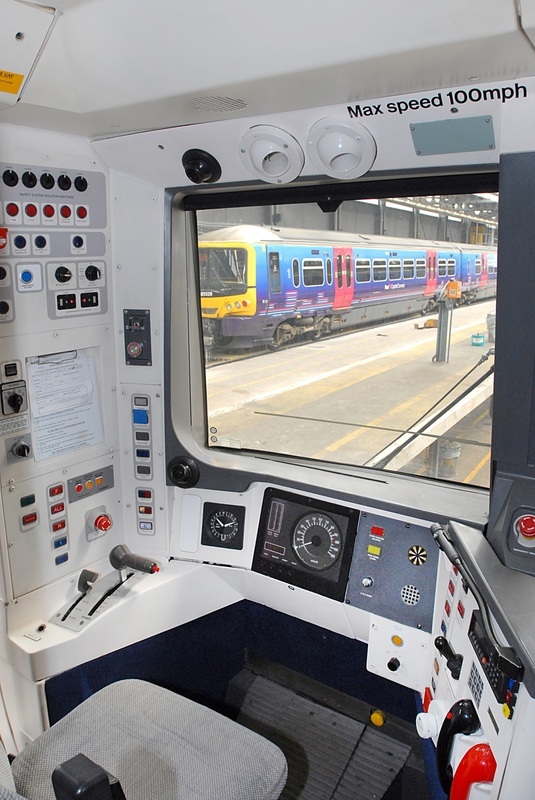 Left: Class 365 'Networker Express'. 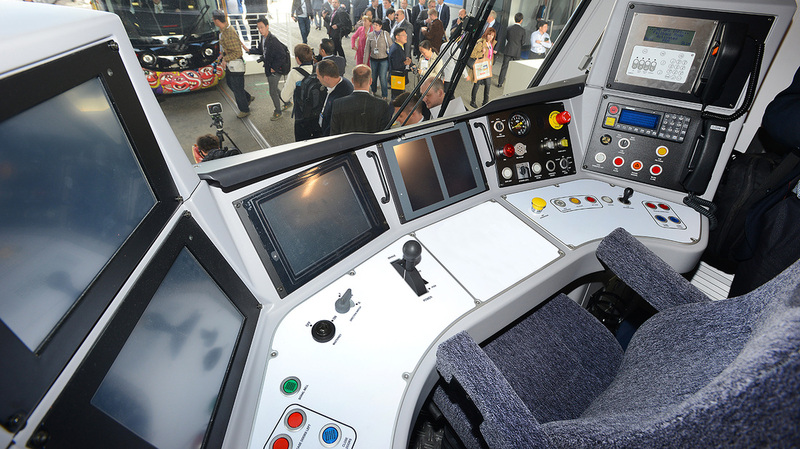 Above: Class 370 Advanced Passenger Train - Prototype. 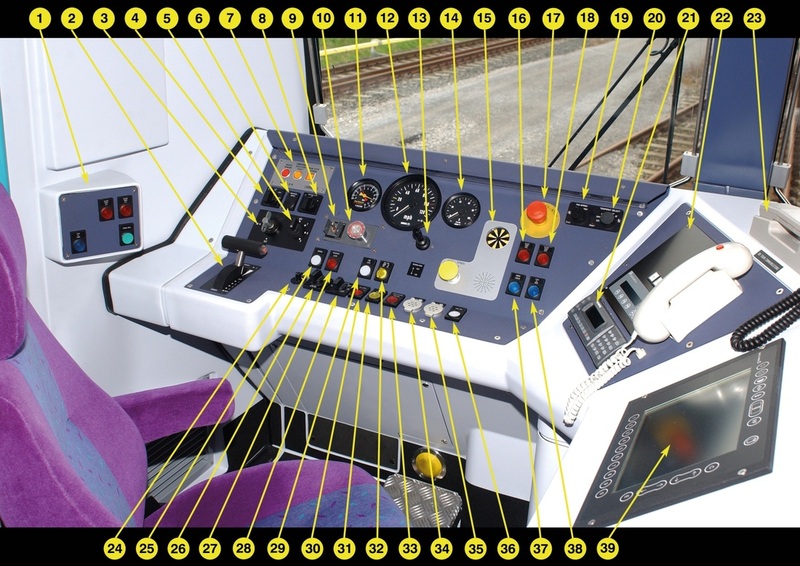 1 - Lighting switch panel (left to right) Cab light bright/dim, Equipment bay light, Right headlight, Left headlight, Marker lights, Right tail light, Left tail light. 2 - Parking brake control panel - apply button, status indicator, release button. 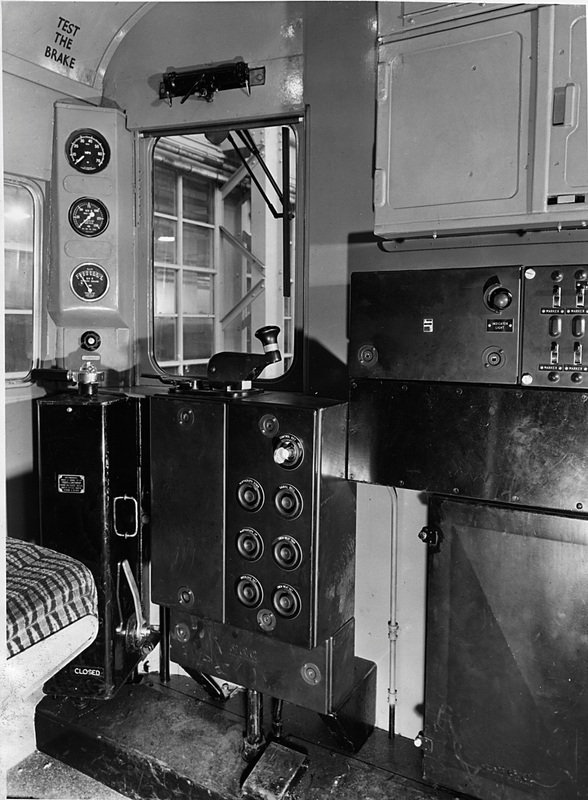 3 - Cab air-conditioning switches. 4 - Axle brake pressure gauge. 5 - Main reservoir pipe pressure gauge. 6 - Emergency brake plunger. 7 - AWS sunflower indicator. 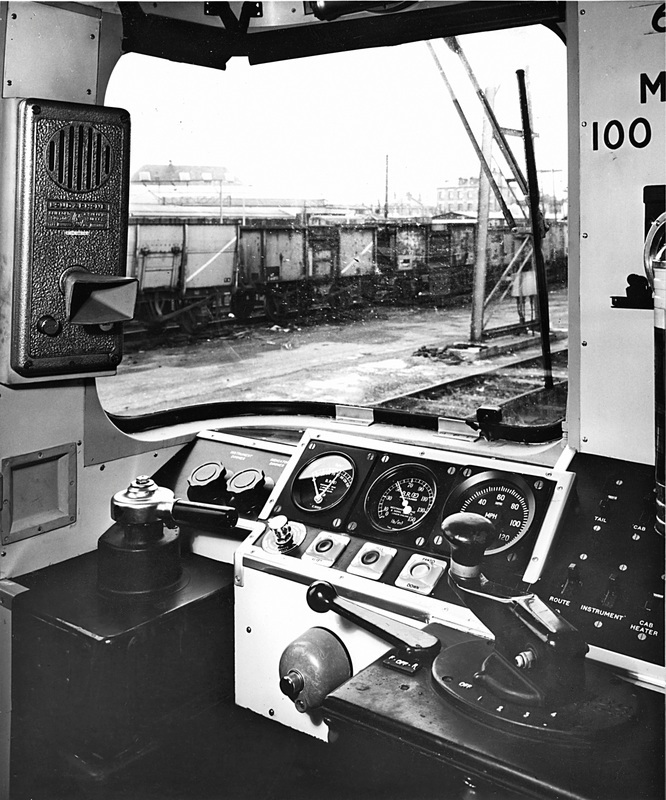 8 - Brake meter (gauge). 9 - C-APT speed indicator (see C-APT ‘Fact File’ on page 73 for full details). 10 - Speedometer (0-180mph). 11 - Clock. 12 - Master switch and drivers key socket. (four positions - reverse, off, auxiliaries, forward). 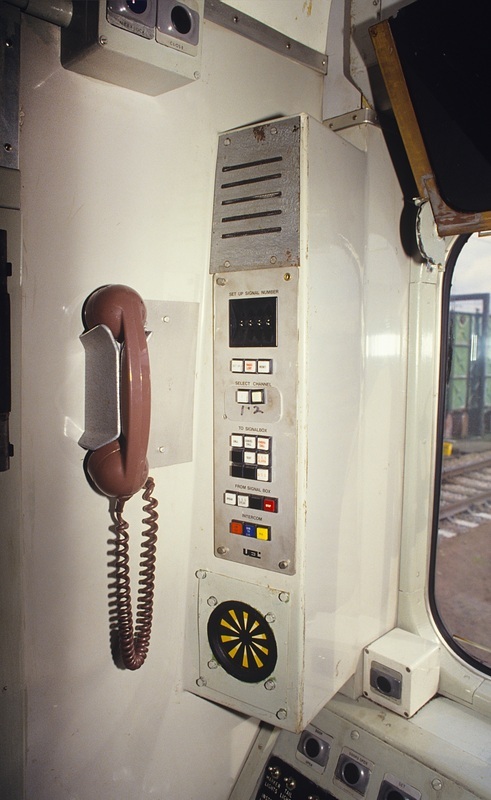 13 - Driver-guard telephone, call button and buzzer. 14 - Fire alarm pull handle. 15 - Fire alarm test button. 16 - C-APT reset button, with warning horn valve behind. 17 - AWS reset button. 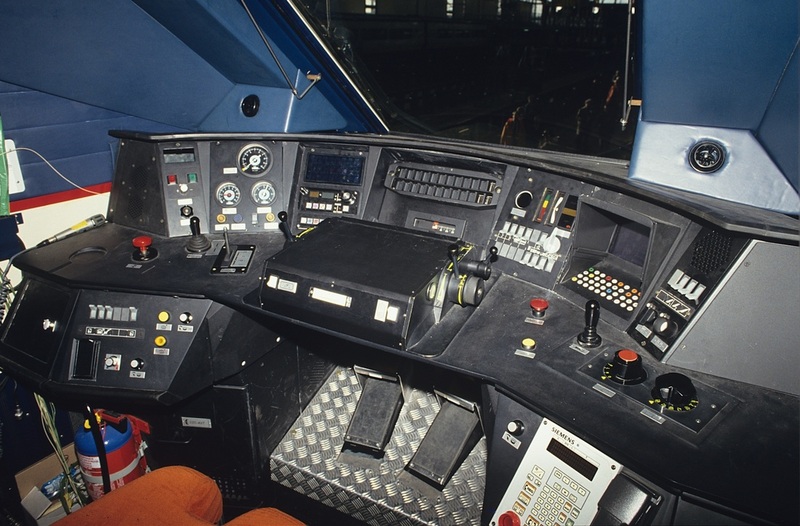 18 - Warning lights (left to right) - Traction Power [indicating insufficient traction available for train to proceed at line speed], Wheel spin, Traction over temperature [warning that the oil in the transformer, choke, thyristor or cooling system is too hot]. 19 - Power controller [with off, seven power notches and a ‘boost’ position to assist in starting]. 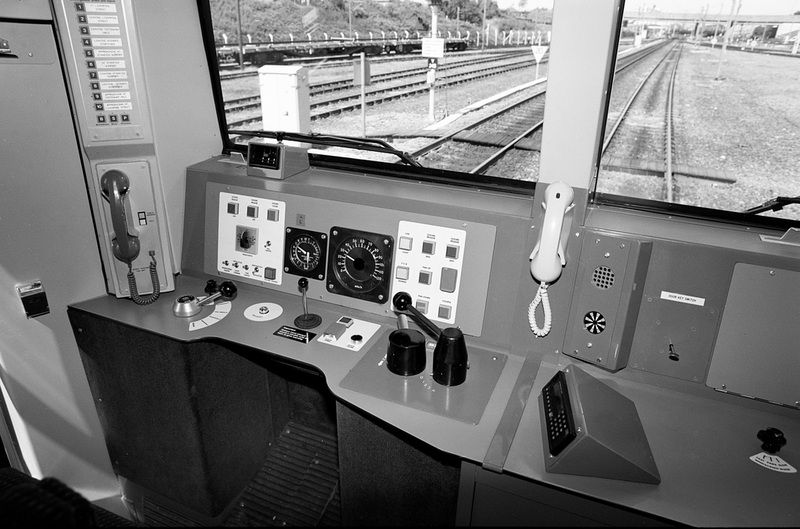 20 - Overhead line controls (left to right) - Pantograph down button, Overhead line indicator light, Pantograph up and re-set button. 21 - Indicators (left to right) Start speed restriction [under C-APT illuminated at the start of a speed restriction], Tilt alarm light. 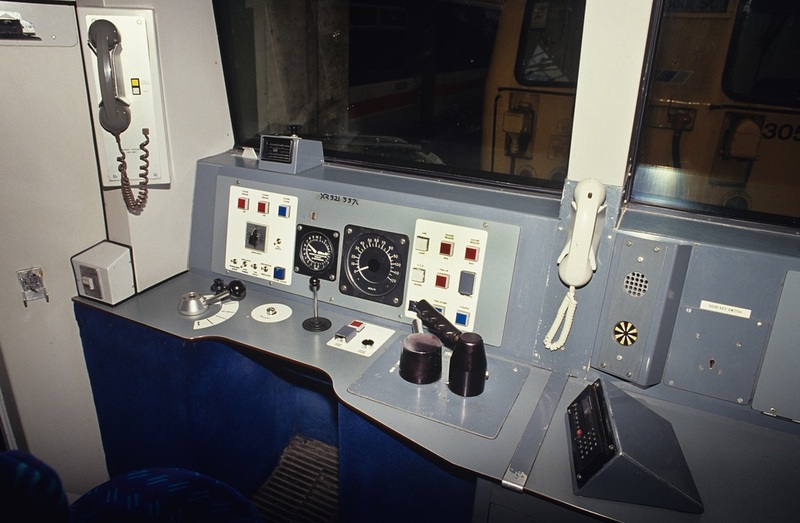 22 - Passenger alarm equipment (left to right) Passenger alarm overide button, Passenger alarm light. 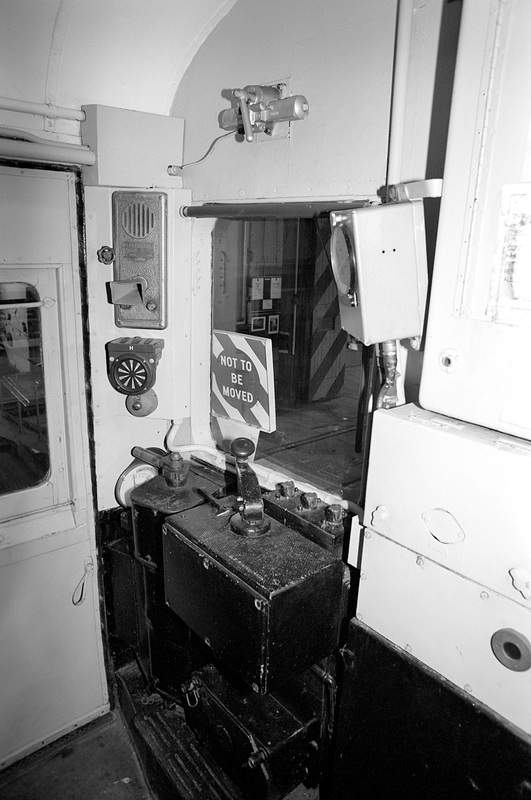 23 - Indicator lights (left to right) - Traction fault light, Auxiliary supply warning light [indicating one or both sections of the train had no three-phase supply]. 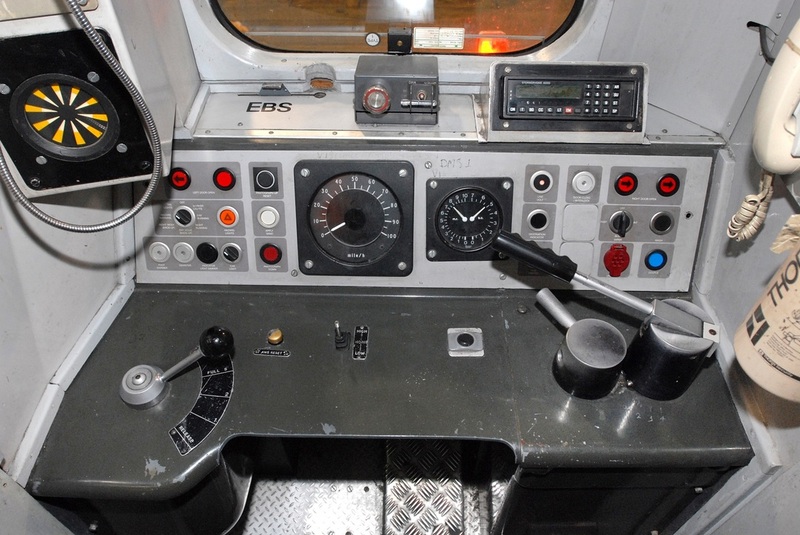 24 - Brake controller with positions Running, Initial, Five service notches, Full service and Emergency. 25 - Desk indicator light test button. 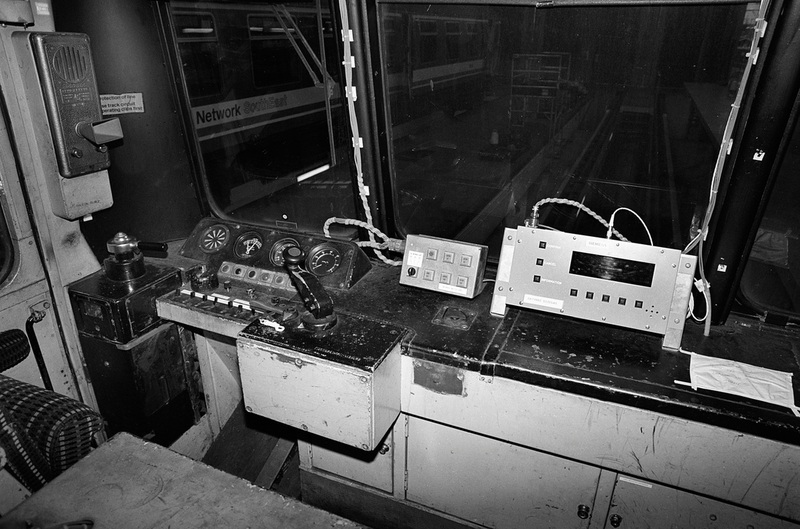 26 - Demister switch (left) Windscreen wiper/wash control (right). A foot mounted Drivers Safety Device (DSD) pedal was provided. 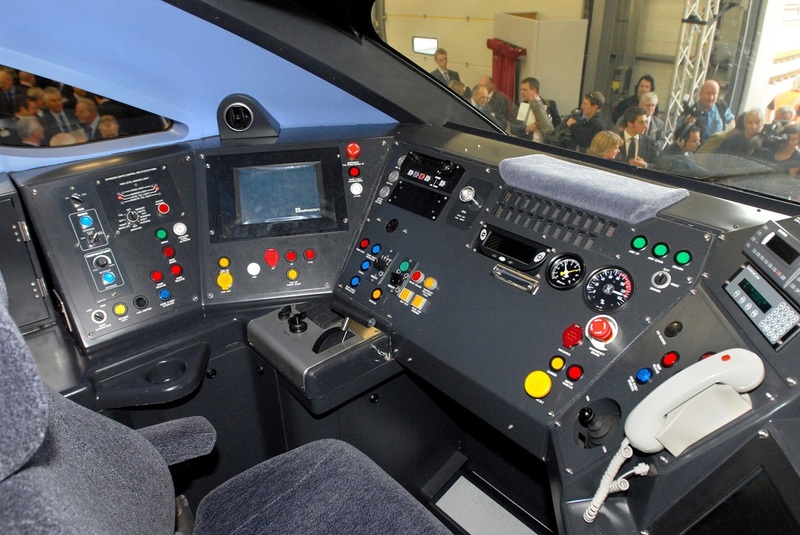 Above: Class 373 'Eurostar' in as delivered condition. Above: Class 373 'Eurostar' travelling at 300km/h on French TGV Nord line. 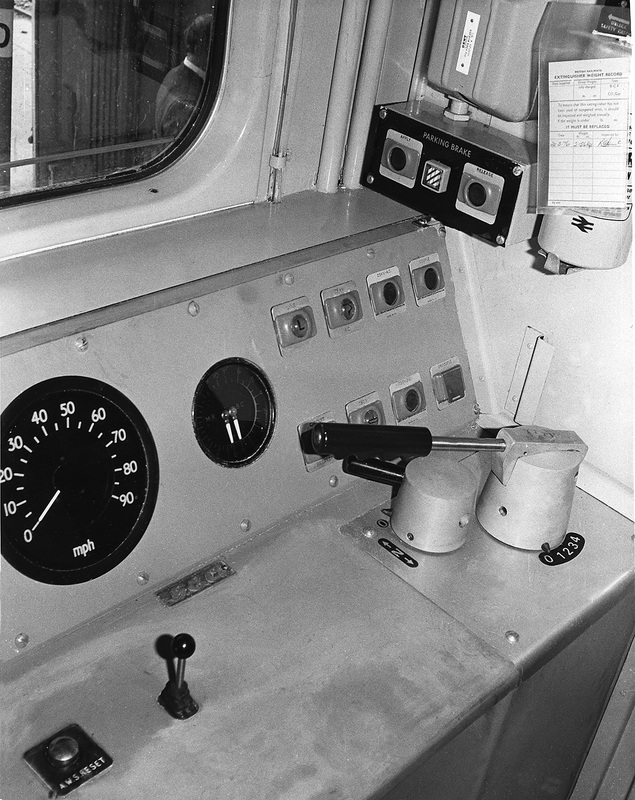 11: On board computer screen, 12: Signal button. 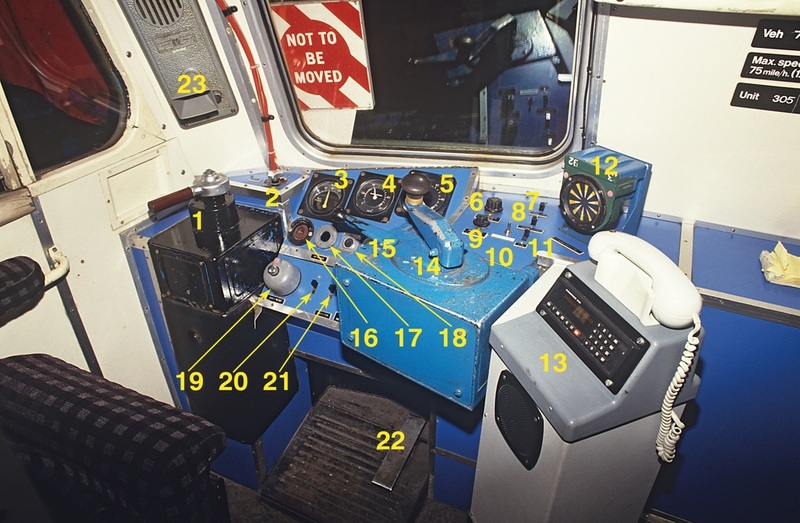 13: Notice board light button, 14: Master key socket, 15: Direction switch, 16: Power/brake controller, 17: Cab light switch, 18: Steward door control, 19: Couple button, 20: Vacuum circuit breaker, 21: Line light, 22: AWS indicator, 23: AWS buzzer, 24: Drivers reminder appliance, 25: Train fault acknowledge button, 26: Door controls left side, 27: Speedometer, 28: Speed set adjust switch, 29: Safety systems isolated light, 30: Brake gauge, 31: Speed set button, 32: AWS reset button, 33: Door controls right side, 34: Hazard warning light button, 35: Pass comm override button, 36: Emergency brake plunger, 37: Uncouple button, 38: Warning horn valve, 39: Windscreen wash button, 40: Windscreen wiper control. 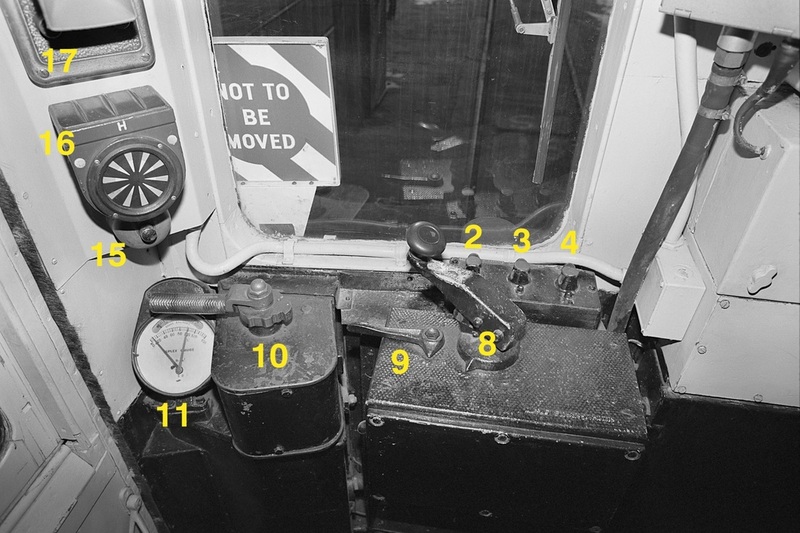 2: Marker light switch, 3: Tail light switch, 4: Auxiliary on button, 5: Auxiliary off button, 6: DC system control, 7: MCB trip button, 8: Cab heating and air conditioning controls, 9: On board computer screen, 10: Buzzer, 11: Notice board light button, 12: Master key socket, 13: Direction switch, 14: Power/brake controller, 15: Cab light switch, 16: Couple button, 17: Door controls left side, 18: Left side door close/interlock, 19: Vacuum circuit breaker, 20: Line light, 21: AWS indicator, 22: AWS buzzer, 23: Drivers reminder appliance, 24: Traction sand button, 25: Train fault acknowledge button, 26: Speedometer, 27: TPWS brake demand, 28: TPWS temporary isolation/fault, 29: Speed set adjust switch, 30: TPWS train stop override, 31: Brake gauge, 32: Speed set button, 33: Safety systems isolated, 34: AWS reset button, 35: Door control right side, 36: Right side door close/interlock, 37: Hazard warning light switch, 38: Warning horn valve, 39: Windscreen washer button, 40: Windscreen wiper control. 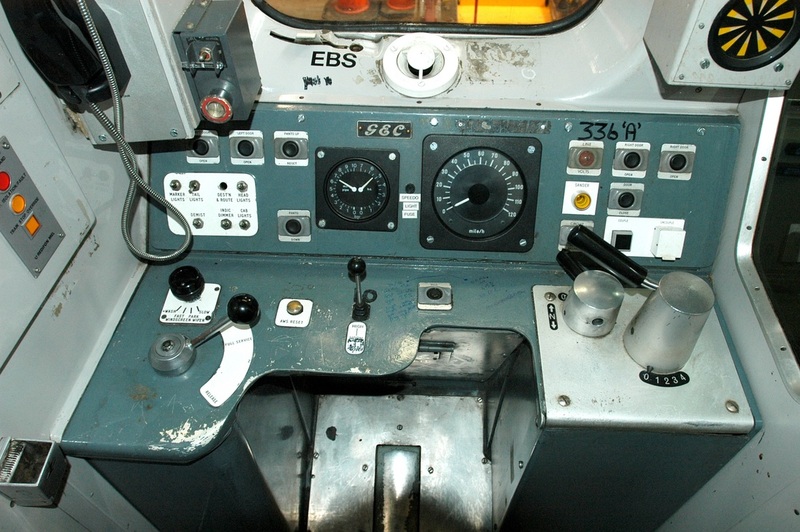 Above: Class 377 'Electrostar' (377/4). 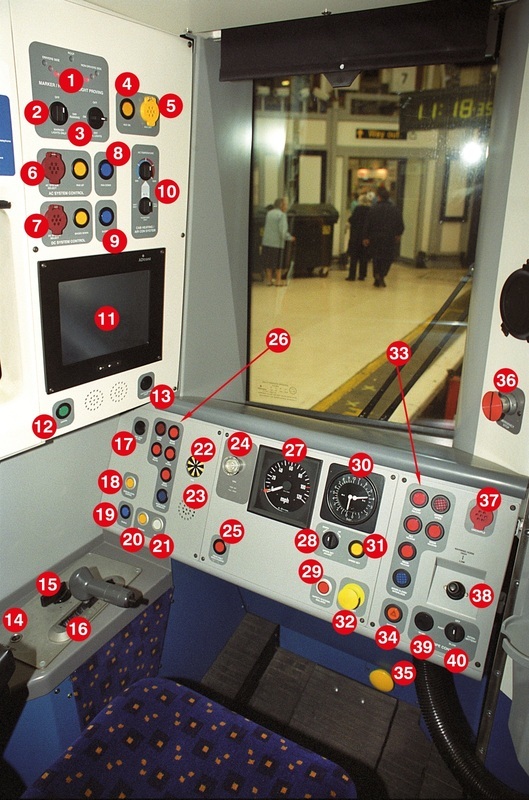 Above: Class 379 'Electrostar' 1: AC system control panel, 2: Pantograph down button, 3: Cab heating/air conditioning controls, 4: Onboard computer screen, 5: Signal button, 6: Notice board light, 7: Cab light button, 8: Depot whistle, 9: Overhead circuit breaker, 10: Couple button, 11: Doors open left side indicator, 12/13: Left doors open button, 14: AWS indicator, 15: Door close left side interlock, 16: Line light, 17: AWS buzzer, 18: Hill start button, 19: Driver’s reminder appliance 20: Sand button, 21: Speedometer, 22: Train fault acknowledge button, 23: TPWS brake demand, 24: TPWS temporary isolation/fault, 25: TPWS train stop override, 26: Brake gauge, 27: Speed set adjust switch, 28: Speed set control, 29: Safety systems isolated warning, 30: AWS reset button, 31: Doors open right side indicator, 32/33: Right doors open button, 34: Door close right side interlock, 35: Hazard light button, 36: Screen wash button, 37: Uncouple button, 38: Horn switch, 39: Screen wiper control, 40: Emergency brake plunger, 41: Master key, 42: Master switch, 43: Power/brake controller, 44: DSD pedal, 45/46: Train camera displays, 47: Telephone handset, 48: Cab radio, 49: GSM radio, 50: Radio select button, 51: Public address, 52: Cab to Cab, 53: Passenger communication, 54: Radio handset, 55: Pass-comm override button. 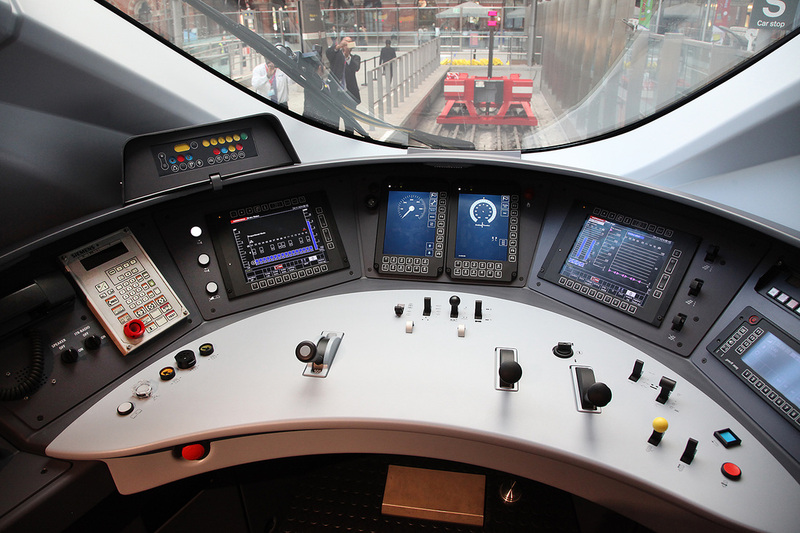 Above: Class 390 'Pendolino'. 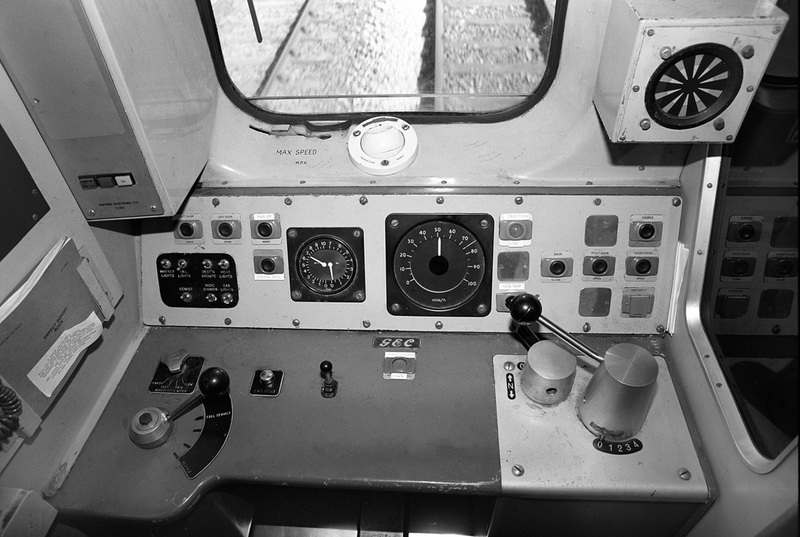 Original cab equipment positions on set 390001, also note different power/brake controller. 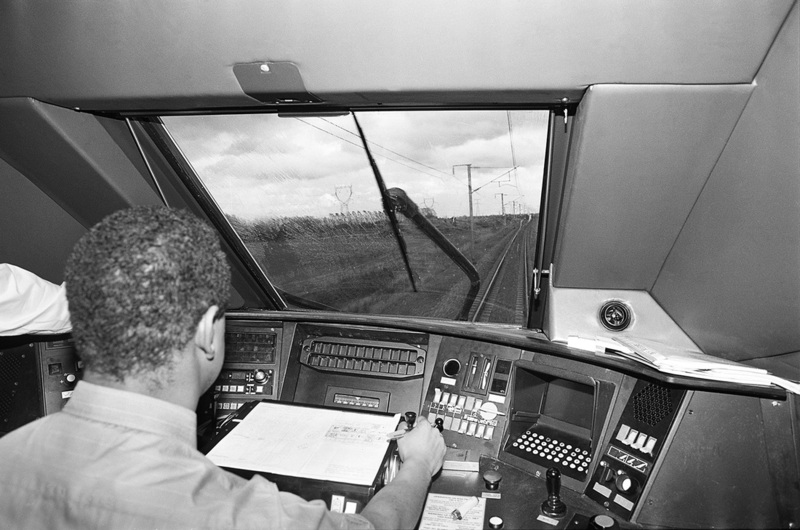 Image taken during testing prior to operation, some changes made prior to release from Alstom control. 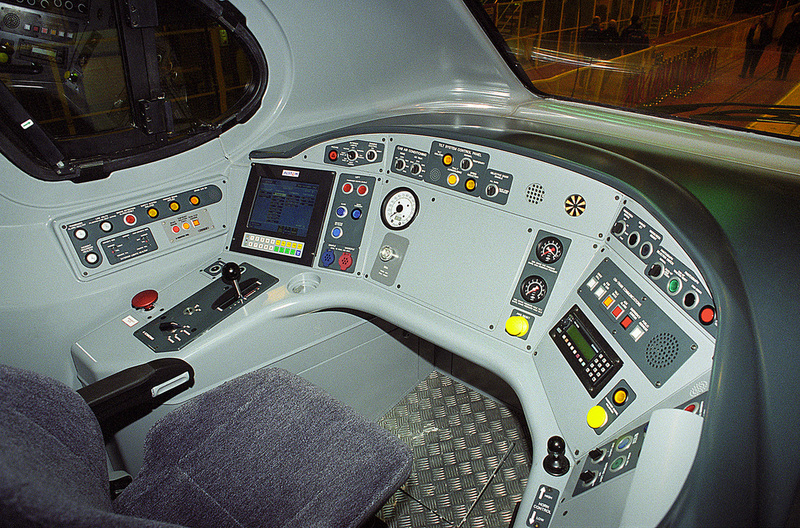 Above: Class 390 'Pendolino' cab of No. 390002 during test period at Old Dalby, fitted with revised power/brake controller and now sports red line light/ADD light on right. Above: Class 390 No. 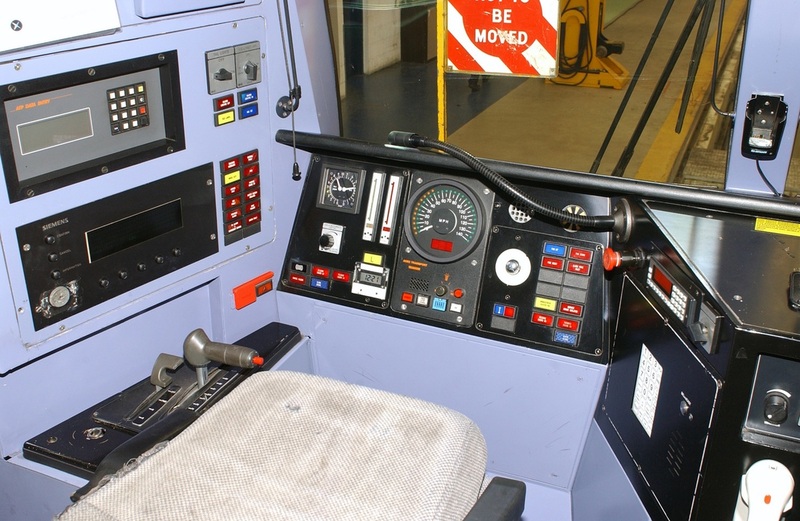 390006 during acceptance tests, now sports better signage, proper labels to the marker light indicators and a proper front panel in cab colour. Above: Class 390 'Pendolino'. 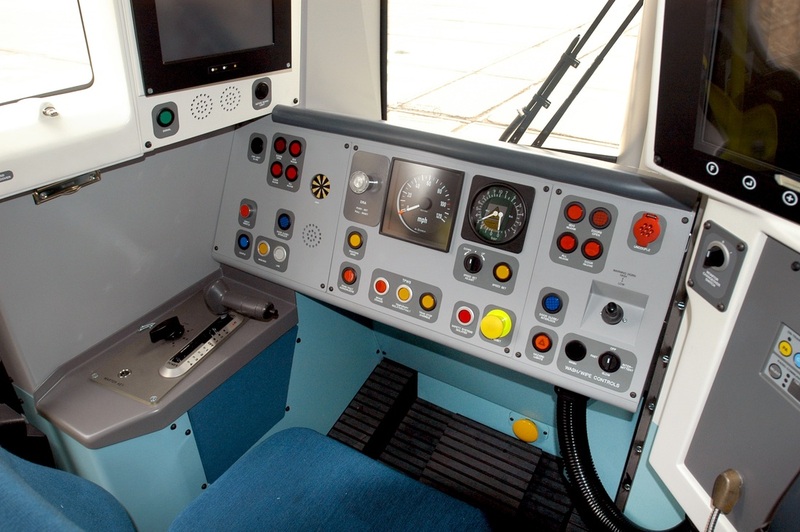 Modified cab fitted with Tilt Authorisation & Speed Supervision (TASS) display panel revised tilt operation panel and move of cab air conditioning controls to right side to the right of communications panel. 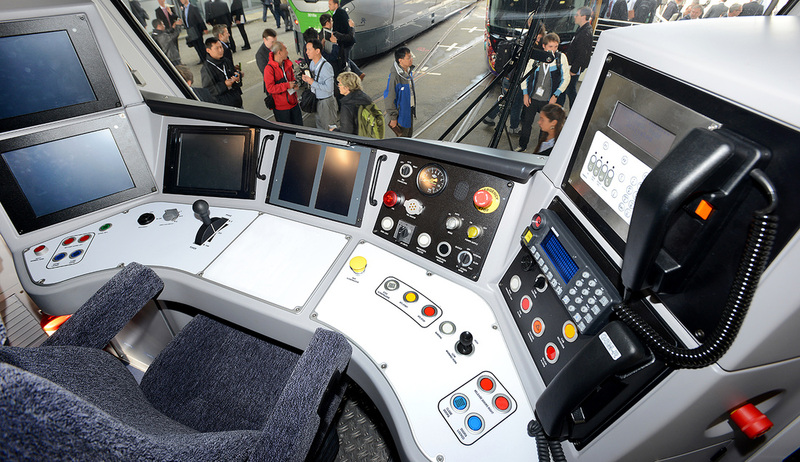 Above: Siemens 'Desiro City' Class 700 for Thameslink.